Friday, November 9, 2018 — Reverb LP, the online marketplace for buying and selling records created by Reverb.com, announced today that it has launched a mobile app for iOS and Android. Since launching to the public in January 2018, Reverb LP has surpassed $1 million in total sales on the platform, nearly three million records for sale, and thousands of sellers on the site. The new mobile app will enable users to buy and sell new, used, and rare records from the palm of their hand. The mobile app is just one of many new tools and services the Reverb LP team has rolled out over the past year. Earlier this year, the company introduced Reverb Sites, a service that enables sellers to create a free, customizable website that is synced to their Reverb LP inventory. 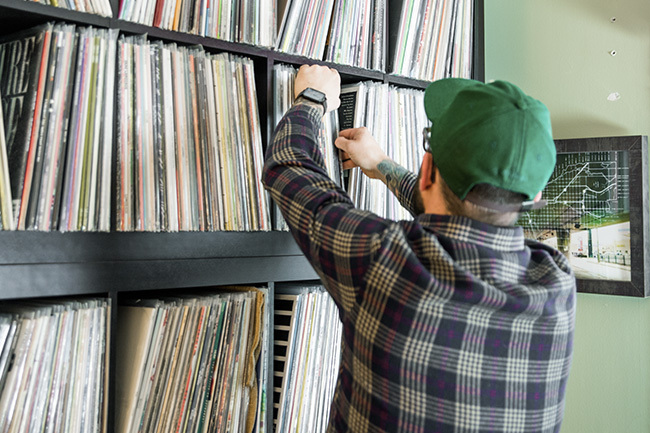 Stores like Sit and Spin Records in Philadelphia are already expanding their online presence thanks to the service. Attracted the attention of artists such as Moby, who sold his entire record collection for charity on Reverb LP, and Sonic Youth, who partnered with Reverb LP to sell rare, out-of-print, and never-before-available test pressings as well as records from the band’s historic catalog and band members’ personal collections. Aligned itself with other forward-thinking record industry pioneers like record of the month club Vinyl Me, Please—which recently joined Reverb LP as a seller—and charity-focused record label Vinyl For A Cause, which partnered with Reverb LP to release a limited edition record featuring Jamila Woods, Kevin Coval, and Tasha that benefited Young Chicago Authors. Onboarded thousands of sellers, like Chris Mathae, who runs Better in the Basement Records full-time from his home in Chicago. According to Mathae, Reverb LP helped him make crucial sales at a time when sales were slowing on other platforms. Today, he estimates that roughly 50 percent of his sales come from Reverb LP. Created videos, articles, and more to help the record community learn and get excited about what they’re buying and selling, including interviews with artists such as John Oates, The Cure’s Reeves Gabrels, Guitarist Dweezil Zappa, The Black Lips’ Cole Alexander, and Songwriter Valerie June. To browse the millions of new, used, and rare records on Reverb LP or set up a shop of your own, visit www.reverblp.com. Reverb LP is an online marketplace where anyone can buy and sell new, used and rare, records. For record stores, sellers, collectors, and fans all over the world, Reverb LP is an easier and more cost-efficient option for buying and selling records and other physical music online. Created by the same team that grew Reverb.com into the world's most popular music gear website, Reverb LP provides the vinyl community with a painless selling experience, tailored tools and services, an easy-to-use interface, and the lowest fees in the industry. Since launching in January 2018, the marketplace has nearly three million records for sale, thousands of sellers, and artists like Moby using the website to sell their own records. To learn more visit www.reverblp.com or download the Reverb LP app on the App Store or Google Play.